When your check engine light comes on you probably start thinking the worst. That little light can wreak havoc on anybody’s good day. Being able to answer the question, “why is my check engine light on?” can help relieve some of those fears and let you know where you stand when it comes to your car. The first thing you should do when your check engine light comes on is to get off the road as soon as possible. While a check engine light could indicate a minor issue, it could also be caused by something more serious. 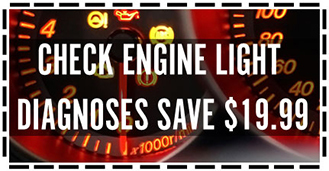 Driving with your check engine light one could cause major engine damage. If you have a car whose model was developed after 1996, you can answer the question of “Why is my check engine light on?” a little easier. All car manufacturers use a standardized system, however this only came into play in 1996. This system is called OBD-II. What it means is that instead of manufacturers having their own group of codes, the current codes that trigger your check engine light are now universal. These codes can be easily read and can help you diagnose why your check engine light has come on. Reading the code has been made easier by the development of an easy-to-use tool called a diagnostic code reader that plugs in to a port (onboard diagnostics port or OBP). Once you have plugged the tool into the port, it will give you a code. The code that is shown by the diagnostic code reader can then be used to determine what may be wrong with your vehicle and what happened to trigger the check engine light. What do the codes stand for? With hundreds of codes to check it may feel overwhelming, here are the top 10 codes that you are likely to read when your check engine light comes on. P0130 – P0177– These codes have to do with your O2 sensor. This sensor measures the oxygen in the exhaust, which then tells your car’s computer whether it needs to inject more or less fuel. P0440– This well known code is often caused by a loose fuel cap. The first thing to do is tighten your fuel cap. A loose fitting fuel cap can cause gas to evaporate over time. P0171 – P0174– This code will be triggered when the catalyst monitor finds a drop in the catalytic converter’s efficiency. This is one code that can mean an expensive fix; it can also mean that there may be other underlying problems with your vehicle. P0300 – P0312– These 12 codes have to do with your ignition coil. The number that follows the P030 code represents the number of cylinders that may be misfiring. A bad ignition coil may not be the only cause of the misfiring and it could be an easy fix such as a bad spark plug, or it could be something more serious. P0101– This code relates to your mass airflow sensor, this sensor meters incoming air and decides how much fuel to inject. You car’s fuel efficiency can decrease greatly when there is a problem with your mass airflow sensor. P0440 – P0449 This code is not just for the fuel cap; it is also the most common code you will find when it comes to your EVAP or Evaporative Emission Control System and faulty hoses. P0401– This code relates to the EGR or Exhaust Gas Recirculation Valve in your car. If this code is scanned, it is likely that you have a bad valve. A problem with your car’s ERG valve could cause your car to idle roughly and your engine to be choppy. P0217– This code will light up when your engine is overheating. This light should come on prior to any damage being done to your engine. Your car may also trigger this code if you are low on coolant. P0463– This check engine code can be triggered by the fuel level sensor, which is found in your car’s fuel tank. If a problem occurs in your gas tank, it will trigger this code. P0115– Triggered by the ECT or Engine Coolant Temperature sensor this code may show up if the PCM or Power Control Module is detecting a voltage condition that is too low or high. A vehicle with this problem may be hard to start, smoking or backfiring. What to do now that you have a code? Once you have an explanation relating to the code you can decide what to do next. It may be as easy as tightening your gas cap or it may be something that you don’t feel you have the skills to fix. Whatever the cause, having the code can help you when it comes to taking it to the mechanic. If you have found that the code scanned could be a serious issue and you don’t have the skills to fix it, you may want to get your car to a professional as soon as possible to prevent engine damage. To ensure your check engine soon lamp has been properly and fully diagnosed by a trained technician and that proper confirmation procedures have been completed for your individual vehicle, please contact the please contact the service department at Vernon Nissan or at 1-800-558-3377.